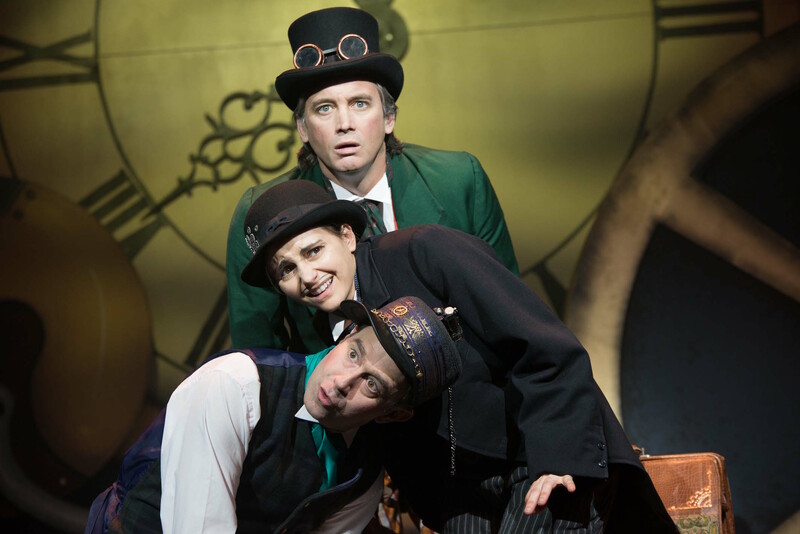 A talented cast and a handsome production partially compensate for an utterly pedestrian stage adaptation of Jules Verne’s Around The World In 80 Days. 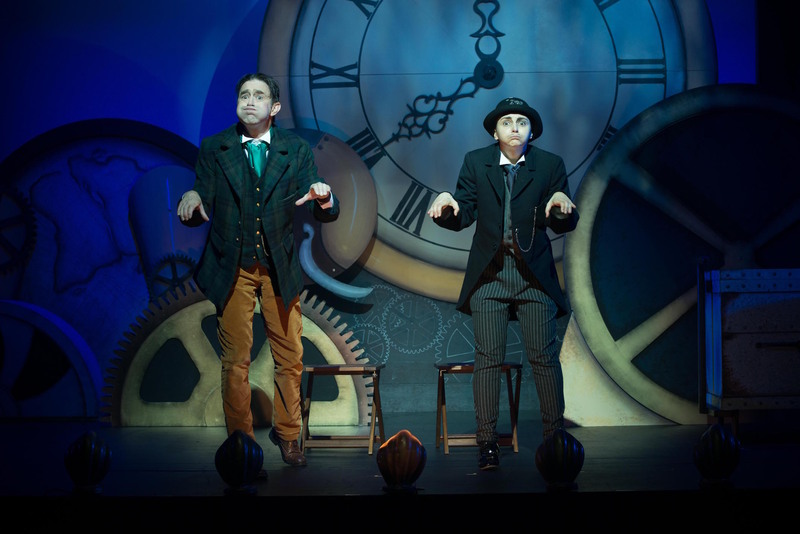 Adapted in many forms in the decades since its 1873 publication, Jules Verne’s Around The World In 80 Days comes to the stage in the style of The 39 Steps, with a multitude of characters played by only three actors and a range of exotic locations suggested by use of props. While the occasional fast costume change or breaking of the fourth wall provides a few laughs, Toby Hulse’s script is bogged down in tedious exposition without a hint of intrigue or subtext. As the days of the trip are counted off, it just serves as a reminder of how long still remains in the plodding journey. London gentleman Phileas Fogg (Ian Stenlake) randomly decides to test the theory that one can travel around the world in 80 days, placing an exorbitant bet on the outcome with some fellows at the club. 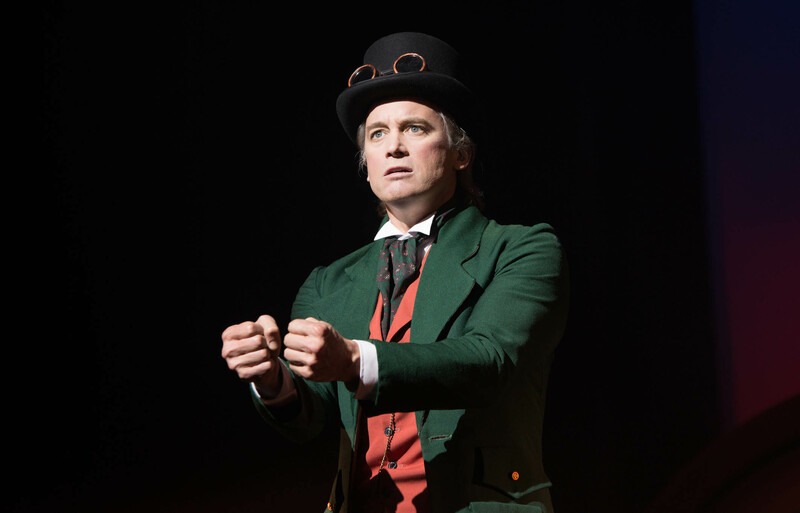 Aided by honest assistant Passepartout (Pia Miranda) and pursued by Javert-lite detective Inspector Fix (Grant Piro), Phileas completes the journey, simply bribing his way out of any challenging situations. Director Terence O’Connell maintains a pleasant atmosphere, having the cast play their roles with merry sparkle. The story and the collection of characters are clear, but the tedious script works against the talents of all involved in terms of ever achieving any kind of momentum. Merinda Backway’s scenic art is an attractive collage of cogs, pipes, clocks and maps, representing both the Industrial Age setting of the story and the prevalent theme of the unstoppable passage of time. Clamshell footlights also suggest a Victorian music hall setting, which is complemented by cross-dressing as the cast works their way through the full range of characters. Ever-creative lighting designer Jason Bovaird creates intricate effects with pinpoint accuracy, also bathing the rear cyclorama in rich, atmospheric colour. Sound design, by Dave Ellis, works in close combination with lighting to create many special effects that help to tell the story. Scenes are also punctuated with Ellis’ appealing compositions. Top marks to Michael “Mush” Brasser’s precise work as stage manager. Equally attractive is Lucy Wilkins’ costume design, which features smartly tailored period costumes. Piro’s costume when he plays Indian beauty Aouda is both gorgeous and amusing. Very special mention goes to Lauren Ritchie for creating the extraordinary collection of beautifully decorated hats, which are one of the key elements that signify changes of character. Stenlake fits the bill as the handsome gentleman with very good teeth, projecting a dashing sense of adventure and a charming manner. Pia Miranda deftly switches hats and characters with a knowing wink, performing each of her roles with a lovely stage presence. 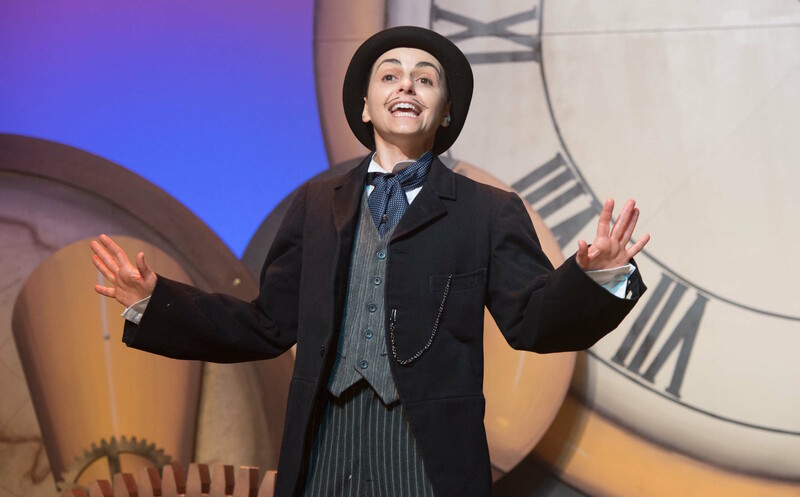 Grant Piro switches accents and body language with flair as he moves between roles, working a vaudevillian energy that is well suited to the performance style of the show. Reasonably priced tickets make Around The World In 80 Days a good value proposition. 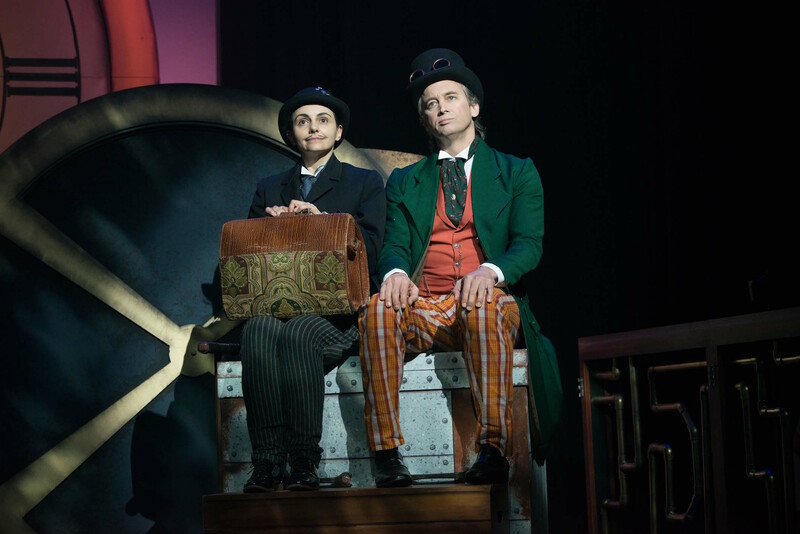 Around the World In 80 Days plays at Alex Theatre, Melbourne until 4 September 2016. It then tours to Geelong, Mooroolbark and Nunawading. 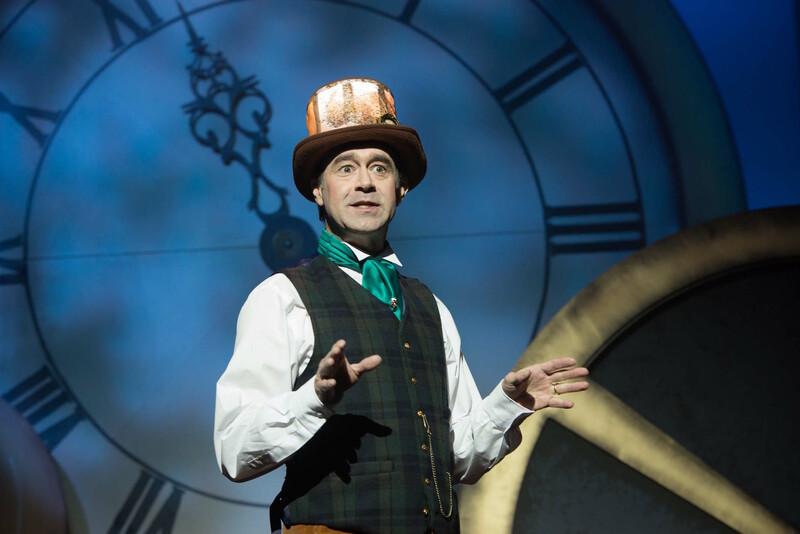 FYI Simon, whilst Lauren Ritchie was credited as the milliner, in actual fact she only made two of the hats. Lucy Wilkins was responsible for the bulk of them, notably the one’s that lit up. Oh, and Lucy decorated all of the hats.